Patriot Ordnance Factory is recognized in the industry for consistently pushing the engineering and design of the AR platform to new heights. With unmatched innovation, POF-USA has created a line of P415 complete upper receivers that include enhancements like E² dual-extraction chamber technology, an NP3 corrosion resistant operating system, a multi-position mode operator adjustable gas plug mode, a match-grade nitrated heat treat barrel and more! If you have the need for superior accuracy and reliability, any one of our P415 gas piston upper receivers won’t let you down! Ideal for a sporting or tactical performance and available in 7.25”, 10.5” and 16.5” lengths. 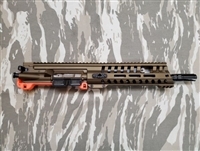 Opt for a rugged and dependable AR15 upper receiver manufactured by Patriot Ordnance Factory. Available in a variety of finishes including black, tungsten, NP3 and burnt bronze.